Make your customers at ease by placing those frequently purchased products — tape, gift cards, cards, wrapping paper, flowers and chocolate — front and centre. There is no better opportunity to maximize your sales than in the holiday season. Typically, grocery retailers see a two-four per cent sales increase during the period with many products see their biggest spike in sales of the year. Consumers are primed to purchase and are actively seeking out new and unique items to enhance the gift giving experience. 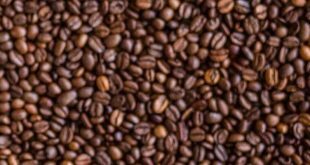 As an influx of new products enter stores, retailers need to look at techniques that allow products to pop amongst the mass of red and green. This begins by thinking about the needs of your consumer and cultivating an environment that responds to them. “There are numerous holidays during the late fall and winter season, you want to ensure that you are inclusive of all of them,” says Crystal Black Davis, vice-president, marketing, Loacker USA. “The merchandizing strategies used can ensure that no one feels excluded, that they can entertain and enjoy, no matter what culture they are part of.” Ultimately it is about providing your consumers with the optimal shopping experience. Carlton Cards notes that consumers are moving towards more personalized cards that are special and meaningful. Perhaps one of the most frustrating things for a shopper to experience is not being able to find what they are looking for. Keeping the store well organized and stocked will help ensure that this disappointment is avoided. For the card area, a critical department during the holiday season, Carlton cards recommends having the store designate a staff member to a daily clean up. “This will help eliminate frustration, as the consumer won’t get frustrated by too many cards out of place or not finding the right envelope in the right pocket,” says Tammy Barrett, director, marketing and trade development, Carlton Cards. The greeting cards industry represents over $700 million in retail with over nine million households that purchase greeting cards. 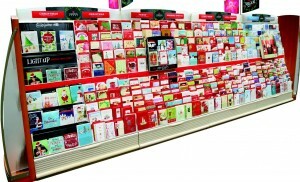 When it comes to shopping for greeting cards, Barrett states that some customers like to linger, with some customers spending up to an hour to find that perfect card. Adding one greeting card to the average grocery basket can increase the basket dollars by 10 per cent. Barrett recommends that the greeting card department be situated about a third of the way into the shopping experience, away from the freezer section where the consumer may get cold and the doorways with the influx of traffic. Retailers should remember that the intent of every display is to engage the consumer to purchase a product. It is important to provide open space in the key areas, ensuring that consumers feel able to linger and really focus on finding that perfect item. With shopping time limited during the holiday season, make your customers at ease by placing those frequently purchased products — tape, gift cards, cards, wrapping paper, flowers and chocolate — front and centre. Visual impact is a big part of merchandising, shares Seguin. With customers constantly on the look for new and unique products, retailers should look for merchandizers that allow flexibility to move throughout the store such as shipper displays, states Tree of Life’s Western Canada Key Account Sales Team. “It is all about product placement when it comes to bringing the customers attention to your shelves and displays throughout the store. Bring some fun and creativeness to them,” says Tree of Life’s Western Canada Key Account Sales Team. The positioning of holiday merchandising is perhaps as important as the design of the display itself. Displays near the entrance of the store, continue to be a huge driver for sales as this captures the customers’ attention right at the beginning or end of their shop. Consumption of peanut snacks is up, shares Stephanie Grunenfelder, vicepresident, international marketing, American Peanut Council, as consumers continue to seek out healthier snack options and integrate peanut butter in their baking. These key products are on the top of mind of the consumer and retailers can create an environment that responds to this need by ensuring that they are accessible throughout the store. To really move merchandise out of the store, do not limit it to a single area. Retailers need to get into the mindset of the holiday shopper, and ensure that the retail experience is a pleasurable one. “Shoppers looking for holiday fare are usually busy — they want the items and ingredients they are looking for to be easy to find, and they are typically looking for items by type, price and recipient if it is a gift — or some combination of all three,” says Rakesh Raniga, president, Indianlife Foods. With customers only having a few moments to shop, retailers can maximize sales by creating displays that pair products the consumers may purchase together. Think of natural pairings, crackers and cheese, tape and wrapping paper, and outside of the box combinations that may entice your consumer to try something new. “A lot of times people are buying meats and cheeses to entertain, and if they are going to entertain with those type of items, the likelihood of them adding chocolate is quite high because they pair very well,” says Black Davis. When it comes to merchandising products, Raniga urges retailers to think outside the box when considering “holiday fare”. Today’s consumers are looking to excite their taste buds, as they seek out more ethnic foods and healthier options. “There is a tsunami of people turning to vegetarian and vegan foods,” says Raniga. “We are also seeing a trend towards more multiculturalism in holiday meals. People are including “something for everyone” and might serve our Chutneys alongside a traditional roast turkey, for example, in lieu of cranberry sauce.” In-store demonstrations are one way to encourage consumers to integrate new products into their holiday meals. Raniga suggests creating a meal-focused display or end cap where all the ingredients for a featured recipe or meal are showcased. These recipe driven displays can also be used with baked goods — providing both the recipes and the core ingredients for consumers who are looking for a homemade holiday treat. “Canadians love baking and entertaining at the holidays, providing recipes in our media research, on social media and in-store can help increase sales,” says Grunenfelder. The key to displays is having an attractive presentation designed to excite the customer to make that final purchase. These unique pairing displays whether designed around consumption or gift giving, are effective because they directly respond to the needs of the consumer. However, there are some consumers that will continue to seek out products in their traditional area. Retailers need to ensure that their environment offers their products not only in outposts but also in their normal area. “Typically, we recommend that retailers have their holiday cards in the main card location, because customers are used to looking for cards there,” says Barrett. “However, it also helps to have outposts in strategic places throughout your store. The bakery department is sometimes a great place for an outpost, because if people are coming in to buy a hostess gift or a holiday treat, they may be prompted to pick up a card while they are there.” In order to create this balance, retailers need to take the time to create a merchandizing strategy that will respond to the need of their customer. Merchandisers alone will not move a product off of the shelf. The displays need to be positioned so consumers will be drawn towards them. Retailers should always be asking the question, do the product displays make sense? The products on the displays should always be easy to access with ample room to move through the aisles. Shelf talkers should be placed at eye level and used to promote key purchase opportunities like “perfect stocking stuffers” or “recommended hostess gift”. 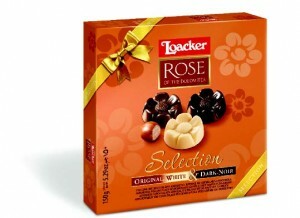 Loacker Foods is finding innovative ways of packaging their products for the holiday season. Sometimes it’s the package itself that encourages that holiday feeling. Retailers can have products move off the shelf by simply integrating packages with a festive appeal. “We are seeing a throwback to traditional, red on green, red on white, white on white, those are still very popular tones and colours for the season but with a bit more of a contemporary spin,” says Barrett. With women as their main consumer, Carlton Cards is continually looking at ways to update both the product itself and its content to the way that women communicate today. Loacker Food has also looked an innovative ways of packaging their products for the holiday season including using a removable festive wrap. “It allows for a lot of flexibility,” says Black Davis. “Once the holidays are over with and the sleeves are no longer relevant, the retailer can pull that sleeve off.” The advantage of this type of product package is that it removes the pressure of having to move it during the holiday season. There is a new wave of consumers that are seeking products that are customized. These products may be inexpensive but will allow them to give that personal touch for a hostess gift, a small token of appreciation, or a stocking stuffer. “Coca Cola has done an incredible job with this,” says Black Davis. “Having the customized bottles with either names or titles that connect people and make the recipient feel that the gift was something special and significant is really taking off.” Black Davis forecasts that this shift to customization will only increase, with more manufacturers looking at adding personal touches to their packages whether it’s a person’s name or a holiday greeting. Carlton Cards has also noticed this want for personalization in the card industry with consumers moving away from the more generic boxed cards towards cards that are geared towards a specific relationship. “People are looking for something that will be a little more meaningful, that will come off as a little more authentic, so that when that recipient gets that card, they know that you’ve selected it specifically for them,” says Barrett. To be able to communicate their marketing message clearly retailers need to look at balancing different things to amplify what they are doing. This can be as static as a shelf talker to as an active as an in-store demonstration, says Black Davis; the key is to move product and make both the consumers and retailers happy.